Walnut Chicken Salad is another easy recipe with a few ingredients that is “oh so good.” I remember this recipe from late junior high and high school. My mom and I used to be in National Charity League (NCL), which is a mother-daughter charity group, and every year we would have an annual tea. Everyone would bring something to the tea, but there were specific recipes that were used each year and this Walnut Chicken Salad was a staple every single time. 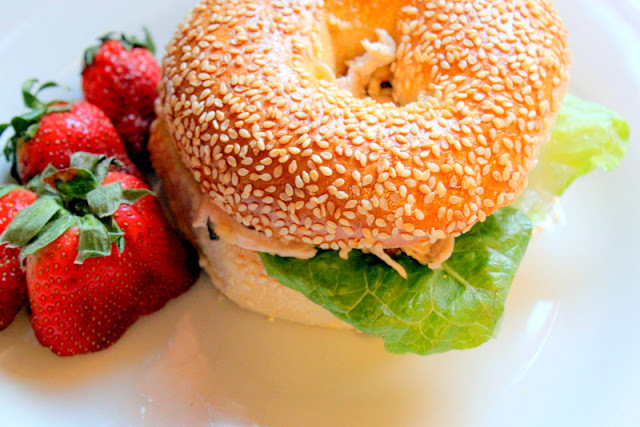 I’m on kind of a bagel kick right now, but traditionally this is served as a tea sandwich. 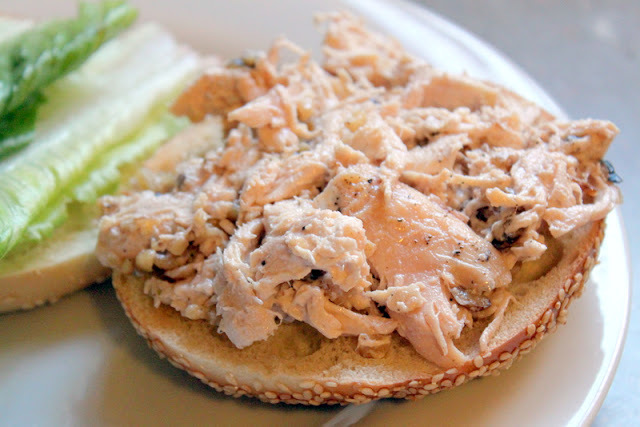 Serve the chicken salad in between two pieces of white or wheat bread, cut off the crusts and cut into four triangles. This is a great dish if you are hosting a lunch or wedding/baby shower. It can be made up to a day in advance and just chill in the refrigerator. Drizzle chicken with olive oil and sprinkle liberally with salt and pepper. 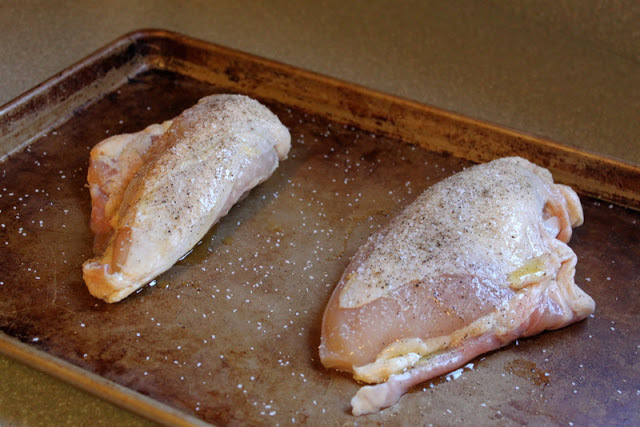 Roast chicken breasts (bone-in) in the oven for 45 minutes at 400 degrees or until the juices run clear. You can also use a store-bought rotisserie chicken for this dish and just remove the meat from the bone. 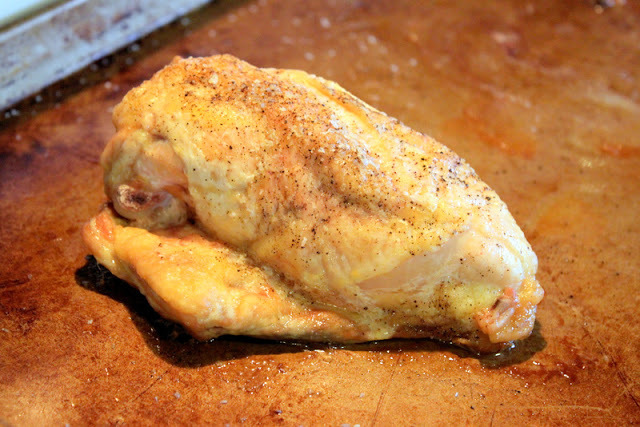 Once chicken is cooked through, remove the meat from the bone and discard the skin. I find roasting the breasts with the bone-in gives the chicken a ton more flavor than just a regular chicken breast – it also keeps it moist. Chop or shred the chicken breast. Combine chicken breast meat, mayonnaise, walnuts and salt and pepper. You do not want too much mayonnaise in this dish because it will over power the chicken, so just enough to keep it moist. Add more if you think it needs it, but less is definitely more. Taste to adjust for salt and pepper. I like a lot of freshly cracked black pepper in my chicken salad. 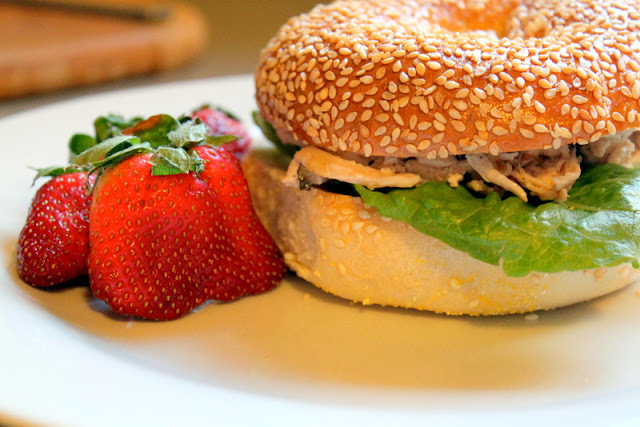 Serve as a tea sandwich (described above) or spread on your favorite bread with some fresh romaine lettuce. Add some fresh fruit and enjoy! Tried this for dinner tonight and it was very yummy. My youngest who is very picky loved it. On some pumpernickle or rye bread this would really be great.